Oriental lacquer is derived from the resin of Rhus vernicifera, the Lacquer Tree, which is indigenous to eastern areas of China from whence it was introduced to Korea, Japan and the Ryukyu Islands from about the 4th century A.D. Thus the lacquer of these countries is quite distinct from the materials also called lacquer produced in India, where it is derived from a deposit left on trees by the lac beetle, or in the Middle East where it is a varnish of the shellac type. Hence also it is different from European lacquer, “Japan”, which is similar to the Near Eastern types. Lacquer resin is tapped from the half grown tree and collected as a translucent liquid which will quickly thicken and become opaque (oxidise) on contact with the air. Applied directly to wood, raw lacquer can be used as a durable hard varnish for furniture, and is so used in parts of China and Japan today. However finer lacquer wares are produced using refined and cleaned lacquer which is painted in successive coats on a carefully prepared ground. Although it can be painted on metal, fabric or paper, the basis for the majority of lacquer wares is a light wooden matrix of seasoned pine. The surface is treated at first with a ghesso-like coating of powdered ash mixed with raw lacquer. This is to fill in any grain irregularities and marks of joins in the wood. The surface is then covered with an evenly woven textile, commonly hemp or ramie but in the later periods cotton or silk, again fixed with a coat of raw lacquer. Repeated coatings of lacquer mixed with even finer powders reduce the weave of the textile until a smooth surface is achieved which, when burnished, is ready to receive the outer decorative coats. This preparation is typically of some twenty five coats and creates a thickness of about 1/6”. Lacquer resin has the quality of drying hard in a humid warm atmosphere, that is a relative humidity of 80 to 85 at 25°C., and a soft sheen can then be produced by the use of stone and charcoal buffers. The surface is very hard wearing and durable, but susceptible to cracking in dry heat and also to fading and loss of surface in strong light. A great variety of finishing and decorating techniques have been developed in the countries in which lacquer resin has been used. These range from straightforward painting to inlay and carving. Refined lacquer is coloured by the addition of mineral pigments: iron oxide for dark red, cinnabar for a bright red, pine-wood carbon for black and ochre for yellow; vegetable colours are not stable in lacquer. These coloured lacquers can be simply laid on to the prepared surface and burnished to a lustrous sheen. This special beauty of sheen has led many lacquer designers to simple striking designs often just using the bright red and black contrast. 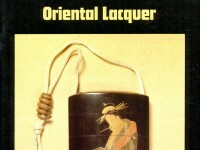 The Japanese lacquerers, however, usually preferred bright colours. These reached their peak of perfection in the 18th and 19th centuries, when medicine boxes (inro) and other small ornamental and useful objects were very fashionable among the same clientele that purchased woodblock prints. Many variations of styles and techniques were lavished on such objects, and the results were of extremely high quality and often of great beauty. One particularly beautiful style used sober variations of black, silver and grey to imitate ink painting, while another style sought to imitate woodblock prints themselves. In the 19th century one famous Japanese lacquerer, Shibata Zeshin, used lacquer on paper for his paintings in Shijo style. Much of the painted lacquer Japan has part of the surface proud. This low relief is built up with ghesso and lac coats, and the surface treated either as painted lacquer or overlaid with thin gold foil. This technique is much used for smaller objects, such as inro or suzuribako (writing boxes), but is also found on a larger scale on the cabinets made for export in the 17th and early 18th centuries. Although painted lacquer must be regarded as the earliest decoration, the carving of the dried lacquer was clearly a very early technique. This involved the build up of successive layers of lacquer to a thickness of at least each coat is laid on and burnished thin so that 100-200 coats are required. When the lacquer is dry the carver cuts into it with a knife edge to make a relief decoration which at first seems to have been geometric but later was developed to elaborate bird and flower reliefs. A further refinement of carving in either style is the use of layers of different colours of lacquer; in the geometric style this is commonly in black and red layers of even thickness, the carved surface showing an elegant stripe as in the ‘guri’ type. The figurative carved lacquers are laid down to a great depth through which the carver works to reveal the appropriate colour so that the background may be yellow and the main body red with some green details. One variation of carved lacquer was easier (and cheaper) than true carved lacquer. This is the variety called Coromandel, where the wood matrix is carved away, so that a hollow is produced, which is then painted in different colours to produce a coloured picture on a black lacquer ground, this ground being on the flat surface of the wood. This type was usually made in China for the export market to Europe. In Japan a variety was made in Kamakura using the same technique, but usually only painted in lacquer in one colour, so that both carved and uncarved parts were all of one colour. In Japan, some lacquerers made carved and painted lacquers in imitation of another material, such as the rough bark of a tree, or a bronze sword-guard or Chinese ink-cake. It is evident from the nature of lacquer that inlay into the wet surface would present few technical problems. Although many inlays have been used, by far the most popular has been mother of pearl or more precisely the pearly inner surface of abalone shell. The earlier inlay in both China and Japan is of chunky pieces of pearl set deeply in the lacquer, but later designs often called for very thin slices laid near the surface and held by a very shallow layer of clear lacquer. One of the commonest techniques, that of building up a picture by use of many small thin pieces of pearl-shell (lac-burgauté) was used in China, Korea and Japan and was a favourite technique in the Ryukyu Islands. Here the shell is very thin, and is often cut into rectangular shapes. Other materials that are used thus are metal foil, shagreen and metal wire. Sometimes such inlay of metal foil is not part of the picture as such, but is used as a background material when evenly scattered on a brown or black ground. This is particularly common as the “aventurine” (nashiji) lacquer used on the inside of boxes. Cut squares of gold foil of different colours and sizes may be used as “cloud bands” or other similar decorative devices in Japanese lacquer. The later inlaid lacquers that use bulky materials, use the same technique as the earlier inlaid work, but have the inlaid material, be it horn, coral, ivory or metal, well proud of the lacquer surface, being bedded firmly in the ghesso and lac under-layers. The most flamboyant of these types are the later inlaid Coromandel work of China, and the rich style associated with the Shibayama school in Japan. More subtle are the Japanese lacquers in Rimpa style that use pewter inlays. Sometimes a natural object such as a shell may be mounted in lacquer as a box cover, or even as a bowl. The Japanese lacquerers often used a combination of any or all of these techniques, making objects of great refinement and skill. In the late 16th century the Japanese exported inlaid lacquers to Europe. Mostly these were cabinets and chests in shapes conforming to European usage. This style (the Momoyama period style) uses thick pearl-shell inlays on a black ground and overpainting of gold lacquer. In the 17th, 18th & 19th centuries both China and Japan exported lacquers. Coromandel screens from China were much in demand in Europe, where they were often cut up for other purposes such as panelling. Cabinets and chests and other things, decorated in raised and painted lacquers, were also in demand. It was these export pieces that were so much imitated in European “japan”.